Picked up the new April issue of Steady magazine (S$16.40) at Kinokuniya in Bugis Junction today as it comes with a HamburGirl tote bag. 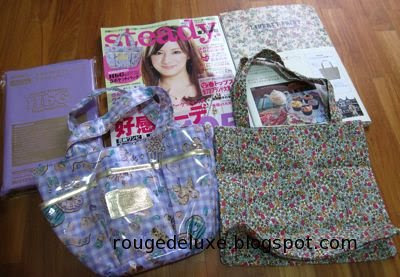 Also pictured is the Liberty mook which I will write about in another post. The tote has three pockets in front for convenient access and is made of polyester and PVC. 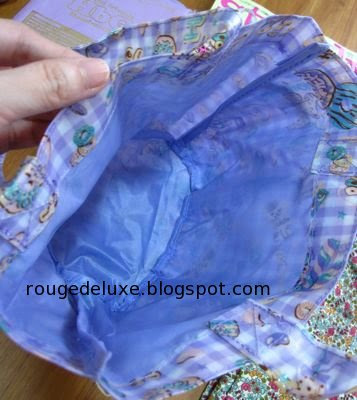 The exterior is reflective and feels like a thin raincoat material while the interior has a purple lining. 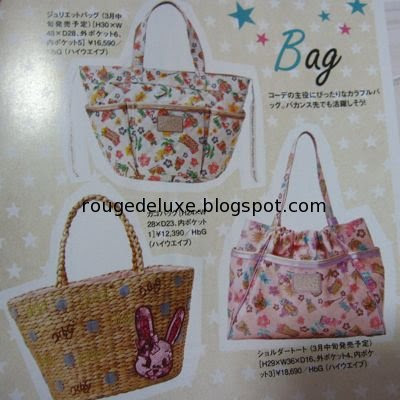 The tote is a bit small but still adorable with a lovely design. 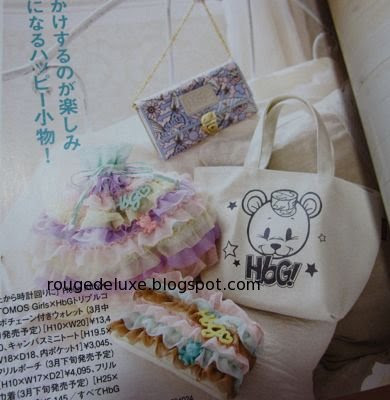 Some HamburGirl accessories featured in the magazine. 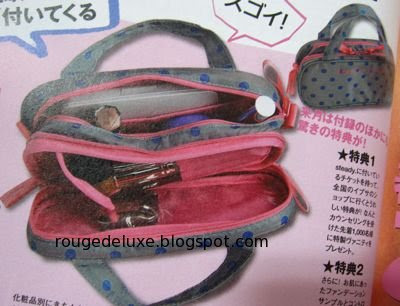 The next issue of Steady will come with a Rebecca Taylor makeup pouch (9.5x19.5x6cm). Due out on 7 April in Japan. 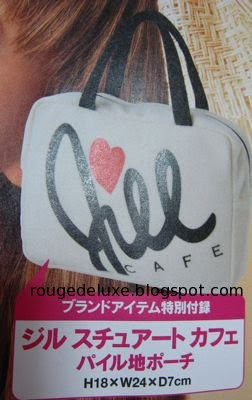 The April issue of Sweet will come with a Jill Stuart Cafe pouch (18x24x7cm). Due out on 12 March. Thanks for the tip-off, Tricia! 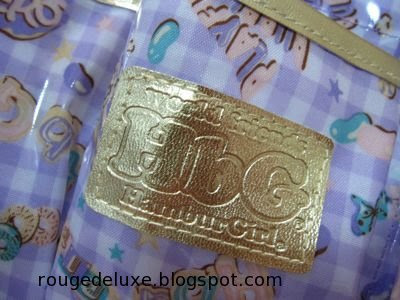 The collection is due to be released in Singapore within the next 2 weeks :-) Can't wait! I was tempted to get the Liberty mook! Oh yes, I definately can remember Liberty in London :) I love that store! I'm looking forward to your review! Oh man, I'm lemming the Rebecca Taylor pouch now! I can see it in my hands in a month's time. Btw I did not see a single issue of L'officiel at Kino orchard today. I didn't bother to ask as I was in a hurry. But there were other gals who were looking high and low like me. I bet they must be looking for this mag. Hmmm... Or did I miss it by accident?? I had to stop myself after eating four of those chocolates so that I can save the rest for another time ;-p They are just too irresistible! I deliberated for quite awhile over the Liberty mook because it was quite pricey but in the end, thought it would be an interesting read as I like these "behind the scenes" publications. I'm actually not too keen on the Rebecca Taylor pouch, thought the colour combination looks a bit strange. I can't remember if there was any L'Officiel left at the Kino in Bugis, wasn't really looking out for it. I guess Kino at Ngee Ann City must have sold out of it! If there are none at the magazine rack near the entrance or in front of the English magazine counter, then probably they've all been snapped up. The L'officiel is sold out already in NAC. Can check late next Monday or Tuesday to see if any came in. 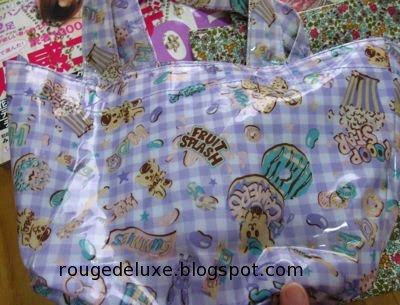 when will steady rebecca taylor pouch be available in singapore? Kino's air shipment days are Wednesdays and Fridays of each week. Since 7 April is a Wednesday, it should arrive on 7 April at the Kino stores in Singapore too, but you should confirm directly with Kino closer to the date of release.